Dr. Eugenie Clark became known as The Shark Lady for her lifelong study of the toothy creatures. Soon Dr. Guy Harvey may be called The Shark Man for his efforts to protect sharks. In recent years, Harvey has been persuading the Bahamian government to ban commercial shark fishing. This week (July 6, 2011), the government announced that it will prohibit all commercial shark fishing in its more than 240,000 square miles of territorial water. Mr. and Mrs. Shark couldn’t be happier. The Bahamas is the fourth country to ban shark fishing after Honduras, the Maldives, and Palau. More than 70 million sharks are killed annually around the world primarily for their fins and the demands of the Asian Shark Fin Soup market. One of the premier shark-watching destinations for scuba divers, the Bahamas has taken in more than $800 million over the past 20 years in tourism revenue from divers who come to watch and photograph the Bahamas’ healthy shark population. Dr. Harvey points out that sharks are worth much more alive than dead. 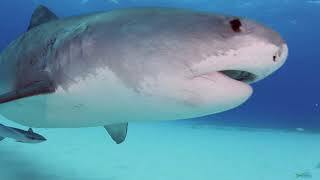 Harvey’s new film This is Your Ocean: Sharks, co-staring fellow artist Wyland and photographer Jim Abernathy depicts sharks in their environment and provides the audience with face-to-face realism. The 44-minute documentary, which premiered at the Newport Beach Film Festival in April 2011, won the prestigious McGillivray-Freeman Conservation Award. Thanks to the tireless work of Dr. Clark and Dr. Harvey, the annihilation of the planet’s shark population may be turning around. Our new superheroes: Shark Lady and Shark Man.